By now you know how much I love baking cookies with my daughter. It’s one of our favorite mother/daughter activities. Along the years, we developed a system: I prepare the dough and she creates the shapes. We have an array of cookie cutters and she loves coming up with new ways of using them. She has such a blast that she invites her friends for baking play dates. They pretend to be on a cooking show. It’s so much fun to watch those little hands creating! 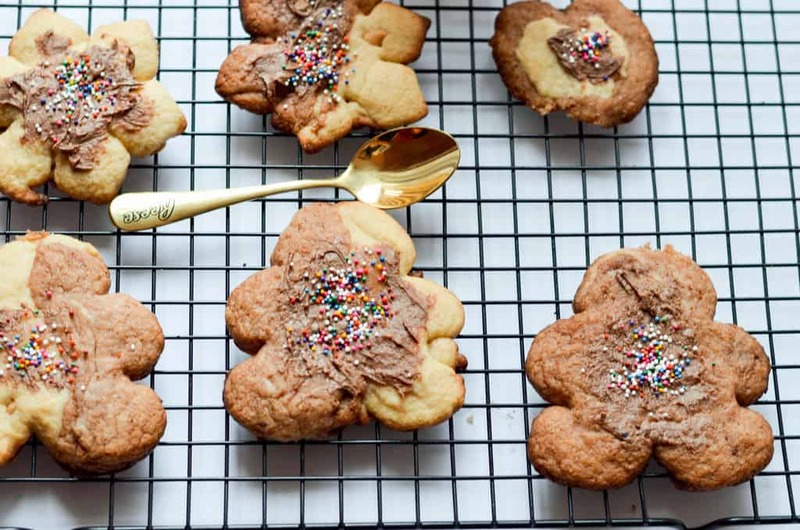 For her last playdate, she decided to bake cookies with REESE Spreads! Her friends heard so many great things about it that they wanted to give them a try (and who wouldn’t? The combination of chocolate and peanut butter is heavenly). So we made the following REESE Spreads chocolate peanut butter cookies! And Oh My!! They are soft, chewy, and delectable. Everything you want in a delicious cookie! Cookie cutters. We used a snowman, a snowflake and fun dog shaped ones. Mix well until you form a dough. Add flour if needed! Separate the dough into 2 bowls! Bake the smaller ones for about 5 minutes. Add one minute if they are not enough baked. Coat few (or all if you wish) cookies with REESE Spreads and top with Sprinkles. My daughter and her friends wanted to create cookies with the 2 doughs to make a nice colorful design. Honestly, I was impressed with their creations! They took it to heart and they had fun creating different designs, shapes, etc! Take a look at their creations! They were so proud and the cookies were just perfect! Chewy and delicious. Adding REESE Spreads to both the dough and on top was a great idea. These cookies make cute handmade gift ideas for family, friends, and teachers. You can give them alone or along with our No-Bake White Chocolate Peanut Butter Cups or our Peanut Butter Chocolate Madeleine. Just layer them in a festive tin, wrap with a bow and you’re done! 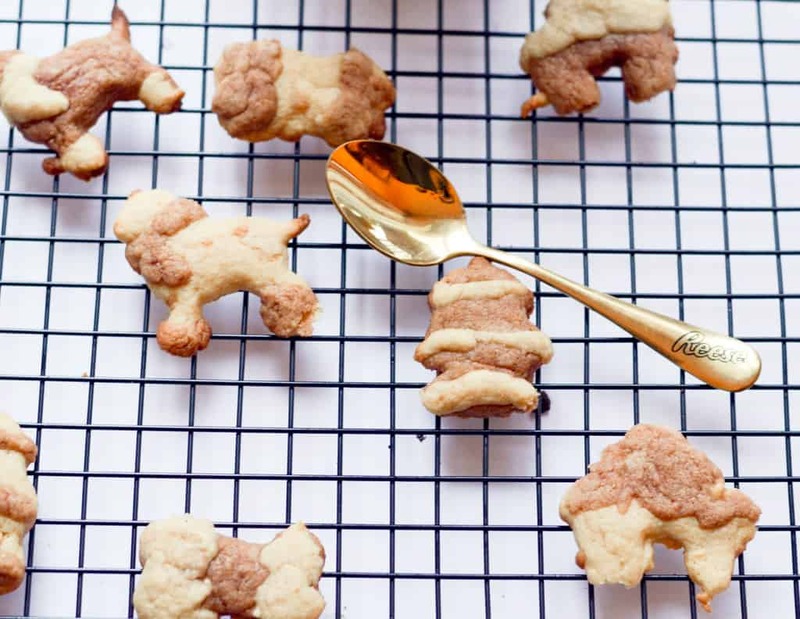 Do you have a favorite cookie recipe that would taste better with REESE Spreads? Tell us about it in the comments! These are a definite must try for me.They look delicious and my grandchildren love anything with chocolate in them. This spread looks so delicious I want to eat it by the spoonful! Great idea to make cookies with it! I love to eat this stuff right out of the jar, i bet it is amazing in these cookies. I have to add these to this years baking list forsure! 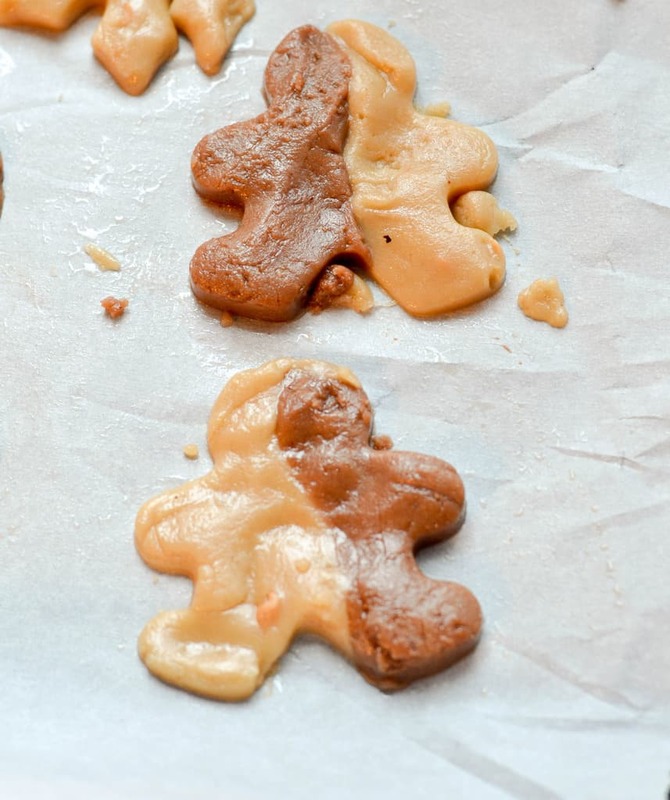 What a fun twist to peanut butter cookies! I have some in the cupboard now and may have to give these a try tomorrow! These look great! I wouldn’t even think to use spreads for cookies! Such a great idea! These look great! Yummy! We love Reese’s spreads- I used it in potato candy and it’s sooooo good! I want these now! I think my whole family would enjoy them. I’ve been in the mood to do some baking, so this may just be what I make. These look really tasty! I love how they are half and half too! Very yummy! Yum! The holidays are baking season and there is nothing I love more than the chocolate and peanut butter combo. Oh yum! These look so good! I am definitely making some of these. I love REESE spreads. Those look so amazing! 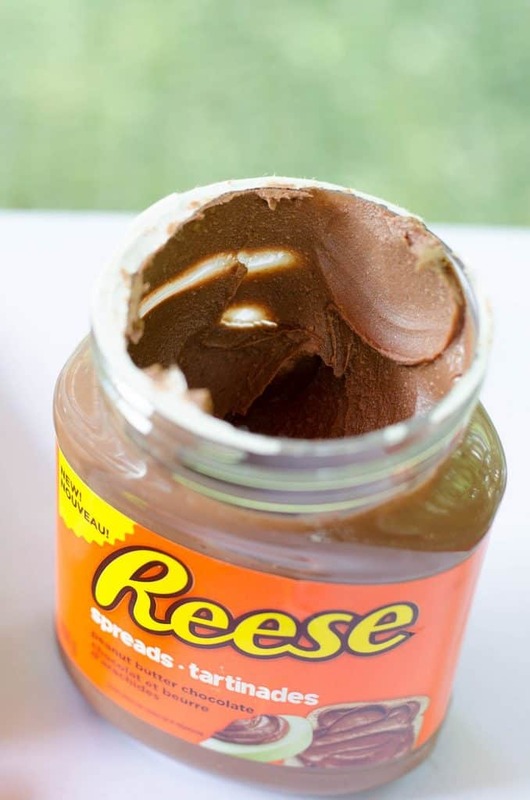 I love Reese’s spreads, so I can’t wait to try this recipe. I love baking with my daughter too and I think it’s sweet. She loves peanut butter but haven’t tried using Reese’s in a recipe. Maybe we will soon! 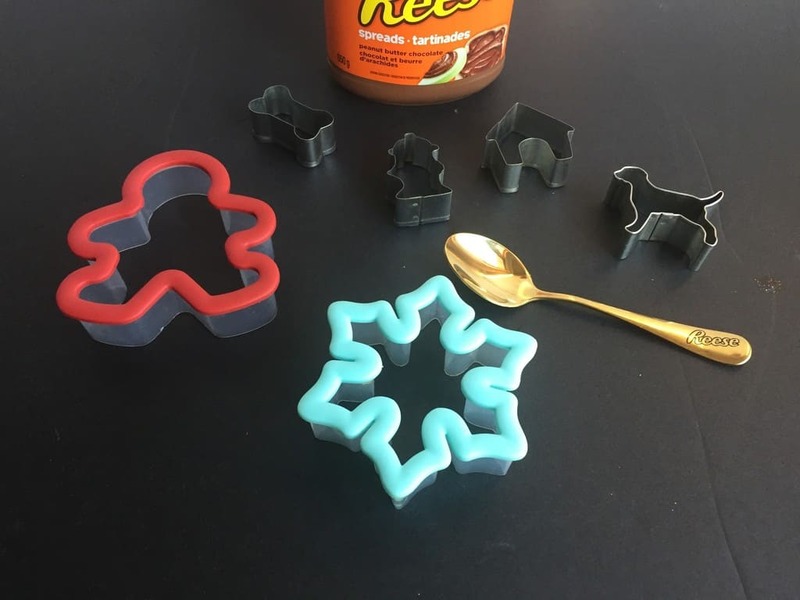 🙂 And oh, I have a lot of cookie cutters but never thought of using them to actually cut/shape cookies. Haha. Thanks for the reminder. I have been wanting to try the Reeses Spreads myself. You made it look so easy to use! These sound yummy. We like anything Reese’s. I love that they hold your shape so you can decorate them too. those look fantastic! I’ll have to try this recipe out : ) yum! I love the Reese spreads. It goes great on everything from cookies to fruit. Making a batch of sugar cookies tomorrow, think I’ll get some of this and try it out! Reese spreads are the best! We love ’em! Never tried putting them on cookies though. Must try that! Such a brilliant idea, never thought of mixing the two colors of dough. How creative and delicious! Peanut butter is such a favorite and classic, can’t wait to try. Wow, these look so good! I never thought to use the Reese spreads in a cookie recipe. I have a weakness for Reese’s so these are so tempting! I’d probably eat the whole batch! Those look really good. I love the taste of Reese’s, so I’m sure I’ll love these. I need to make some for my husband and girls! Those cookies sound amazing. I haven’t tried the reese spreads yet. I should get some for my boys. My kids love the Reese’s spreads. I have never thought of using it in a cookie before. They look delicious! Ok, Resse’s are probably my favorite candy ever! I don’t think there is any cookie recipe that couldn’t benefit from Reese’s spread! I love this idea and am definitely going to get a jar and make some of these! These sound SO GOOD!!! I cannot wait to try these this weekend – they look incredible and I love the swirled look they have. So smart – and who could resist Reeses?! These look so delicious! I love the idea of mixing the two – they look really pretty also! I absolutely LOVE Reeses! My absolute favorite! I love Reeses!!! These cookies sound amazing, what a great cookie to make for the holidays!! I Love Reese Spread It’s Delicious So I Can Imagine How Yummy This Recipe For Cookies Is Going To Be! I Will Be Making With My Girls Thank You So Much!! Ok, I just saw that stuff in the grocery store yesterday and for the life of me I couldn’t figure out what to use it for. This looks like it would be delicious and a lot of fun! Those sounds so delicious! 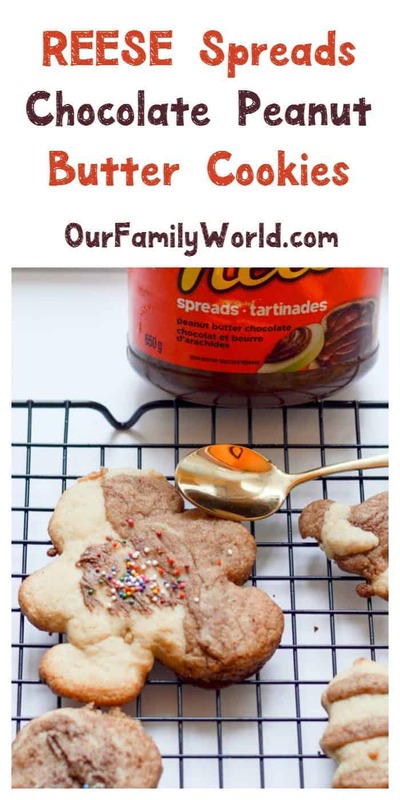 My kids love Reese Chocolate peanut butter spread, so making cookies would taste great!I’m going to try this with my daughter this weekend. These are so cute and they look and sound yummy. I love Reese spreads, they are so good with a spoon right out of the jar! These look and sound delicious. You can never go wrong with peanut butter! REESE Spreads are so delicious. I will have to try adding it to my Peanut Butter Balls this year. Yum. Love Reese! Will have to make these for my family. I’m sure they’d love these! Oh how much we love Reese’s peanut butter anything in this house. I would to try thumb print cookies with that spread in the middle. I will be experimenting with this, i never thought to use this to bake. My kids love Reese spread. They will surely go crazy for this! Yummy, these look so good! I am a huge fan of peanut butter. Yum! I love REESE spreads. And these cookies look so tasty! I have to try them. I am adding Reese’s Spreads to my shopping list right now. It looks so good and these cookies will get gobbled right up in my house! These sound so delicious. My kids would love them. I love your cookies. I’d eat that. It looks delicious! I love he combo of peanut butter and chocolate. Chocolate and peanut butter PLUS cookies? That sounds perfect. I could add peanut butter and chocolate to everything, and those spreads make that task even easier! I haven’t tried them yet, but I already know I’m going to love them. How yummy! Reese’s spreads are delicious. We’ve been buying them ever since Reese’s came out with them. I’m looking forward to trying this recipe. Those cookies look delicious. We use Reese’s spreads all the time, but I’ve never tried to make anything with them. I can’t wait to try this. These new spreads are awesome. I get them all the time, but we mostly just eat it. I’ve never tried cooking with it before.